ALL TOGETHER NOW . . .Peter Hutton believes his squad can cope despite being set to lose four key men for the season opener against Galway. A FIRST team squad of 18 players may not be ideal, but with FOUR of those players banned for the opening game in Galway, Derry City boss, Peter Hutton, will be praying none of his players pick up any injuries before then. Due to an accumulation of yellow cards last season, Hutton must plan without TWO of his back four for the new season opener against Galway on March 6th. Shaun Kelly, Ryan McBride, Mark Timlin and Stephen Dooley will all miss the trip to the west, a fact that will give Hutton a major headache. And try as he does to add new faces, the Airtricity League’s Transfer Window closes next weekend, so time is not on Derry’s side. There’s been talk of Hutton’s interest in adding a number of experienced players but, at this late stage, any recognised personnel have got themselves sorted, so much so that the manager may well consider himself for a place on the substitutes’ bench next month! “Time is certainly against us and while I would dearly like to add a few experienced players, I have to say that I’m very happy with the squad we have assembled. “If it turns out that we don’t add any new players, then I’m happy to push on with what we have,” insisted Hutton. Of course, the fact that Derry will receive £110,000 following the transfer of Michael Duffy to Celtic won’t make dealings in the transfer market any easier, but given the current financial situation, paying large fees for new players is not an option. 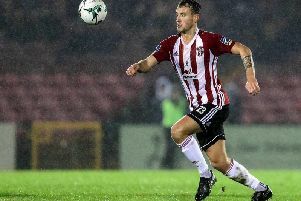 “Four players suspended for the Galway game certainly does not help us, but our focus continues to be on that match,” added the Brandywell boss. Tomorrow afternoon, Hutton will lead his charges against a Saturday Morning League Select at the Brandywell. Kick-off: 2.00 p.m.